Another long week in the lab. Research continues (knock on wood) to go quite well. Me and my lab-mates certainly have enough chemistry to get done to keep us busy. The odd thing to me about grad school is the lack of “school”. I really don’t feel the same sort of pressure to perform at 110% in class. I mean don’t get me wrong I sure as hell still try and still do the assignments early, but its different (and clearly hard to explain). I treat grad school more like I would a transitional job (where I’m there pretty much to pump out good research) rather than an extension of my undergraduate career. Hence why I work 12+ hour days because its my job to make chemistry (and make a lot of it ) happen. Because I’m always there late, I’ve made a friend in one of the other groups (a 5th year doing some pretty cool organic synthesis). We hope to do a collaboratory project (adding to my ever-long list of things to do) at some point on a project he has been developing. In other news Dr. Ronald Breslow paid UConn a visit as part of our R.T. Major symposium. I had met Breslow before when I was down at Columbia so I had an idea of what he did and the kind of guy he is. Nonetheless, I was very impressed with his talks, in particular, one regarding the origins of why natural amino acids are (L) and natural sugars are (D). I also read up on it following the talk in a recent article published by his group. While one can never really “prove” with absolute certainty that the process proposed by Breslow is truly what lead to all amino acids (natural) being (L) it does at least give us a theory to possibly explaining it. But enough about all that, you’re here for the chemistry aren’t ya? So let’s talk chemistry! So, this article also has a bit of irony to it (though not the element). My wonderful girlfriend recently got me a book I’ve been dying to have: A Guide to Fluorine NMR for Organic Chemists. It is by far one of the best organic chemistry books I’ve gotten besides the holy bible of named reactions, Strategic Applications of the Named Reactions in Organic Synthesis. The book only has one author and he has somewhat of an unusual last name. So, unknowingly, when I was scrolling through the ASAPs, I stumbled onto this gem of an article in JOC. Low and behold, it was written by the same chemist that wrote my F-NMR book (therefore I have to review it right?)! 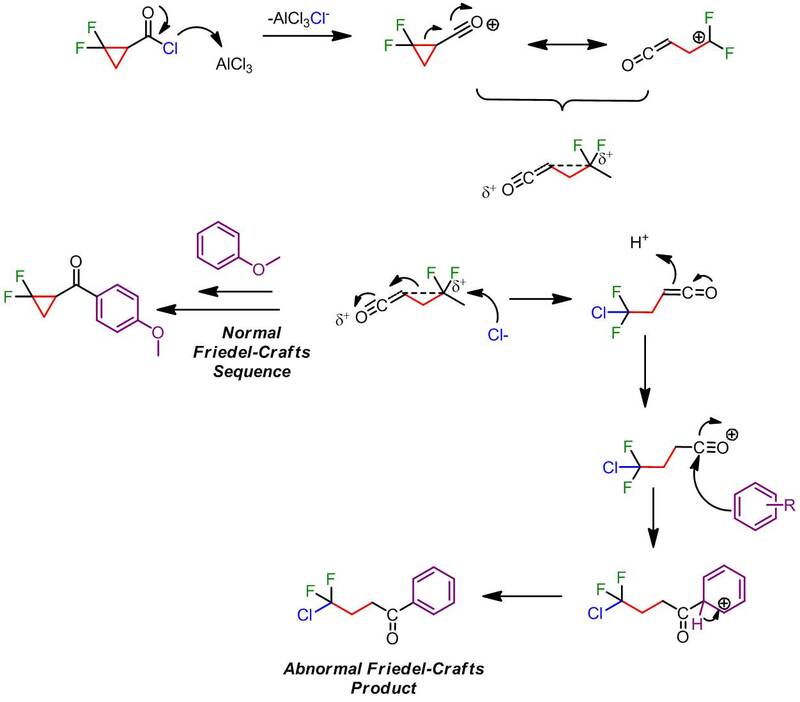 The article starts out by outlining how the synthesis of 2,2, difluorocyclopropyl ketones has been realized by the discovery of a difluorocarbene source, trimethylsilyl ﬂuorosulfonyldiﬂuoroacetate (TFDA). The Dolbier group pretty much has been pioneering this reagent and exploring its applications/reactivity. I wouldn’t say it’s terribly well-known simply because there often isn’t a call for geminal difluorocyclopropanes. However, Dolbier (who is the editor of J. Fluorine Chem. which I found pretty awesome) has been exploring the reactions of 2,2, difluorocyclopropyl ketones and found some interesting reactions. Instead of giving the normal, unrearranged acylation product, it gave the straight chain compound via a ring-opening reaction. Not only that, it gave a mixed halogen ketone which is until this paper would be near impossible to synthesize. Since these are new compounds, their synthetic potential has yet to be explored so the authors really couldn’t give too much in the way of an application. But they certainly did decide to determine the scope of the reaction. The reaction seemed to work best with alkyl benzene derivatives (toluene, ethylbenzene, p-xylene). Moreover they were sensitive to sterics: the higher the substitution on the benzene ring the slower the reaction (discovered via a competition reaction between toluene and p-xylene). They argue that this intermediate explains the reactivity they were observing in that the chloride anion competes with acylation of the arene. Since the more activated arenes react faster, it’s no surprise that these give more of the non-ring-opened product as they can actually compete with the chloride ion. Likewise, having additional amounts of the arene (5 equiv) leads to out competition of the chloride ion from a statistical standpoint (and why it never fully gives 100 percent of the unrearragned product). What I really loved about this article is the thoroughness. Not only did they back up their hypotheses computationally, they were sure to do several control study to ensure that their proposed mechanism wasn’t an artifact of decomposition of the unrearranged product. First, they extended the reaction times and noted no increase in the quantity of rearranged product. Also they took the unrearranged product and treated it with AlCl3 under the normal reaction conditions and noted no reactions. 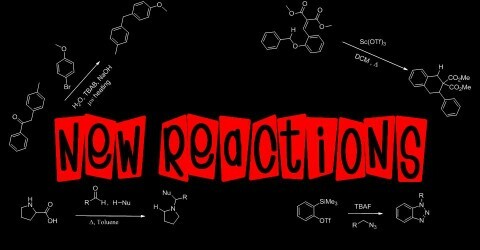 To further verify their findings, they then compared the Friedel-Crafts reaction to other reactions done by the group. The nucleophile actually ends up substituting the “less” hindered and more reactive CH2 group over the CF2 group. Therefore, if the reaction is truly more SN2 like (which its not) we would expect to see more substitution at the CH2 group. Since we see a more analogous reactivity to the solvolysis studies, one must conclude that the difluorocarbocation is the reaction intermediate! Awesome write-up on so many levels! Thank you. You’re a talented story teller. Too. Funny, I was just reading up on the origin of chirality this morning. Thanks!!! I’m glad you enjoyed it, I tried searching for that article you were looking for for like an hour but to no avail. Let me know if you find it!!! And I love hearing comments on my post/discussing chem so yeah comment as much as you want! Third Publication! Won’t you be my neighbor?